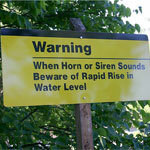 There are many dangers involved in boating around dams. This is why authorities use signs and signals to warn boaters to keeping a safe distance. If you search the Internet you can find some harrowing stories about boating accidents around dams. Many of these accidents occur as a result of engine trouble while boating upstream. 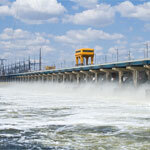 Danger may also lurk downstream, as dams can release large amounts of water without warning. The best advice is to stay away. If that is not a option, here are some tips. Larger dams always contain appropriate signs, markers and buoys to warn you of the danger and to remain at a safe distance. 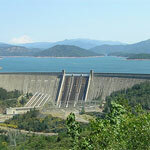 Low-head dams, however, may lack warning signs. Before starting out, know the dam locations, check water levels and conditions, be cautious of flash flooding when boating after periods of heavy rain and avoid getting too close. Always remain vigilant when approaching a dam from upstream. 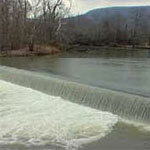 Low-head dams that do not offer visible warnings may be difficult to detect. It’s important to know where the dam is located. Concrete retaining walls along banks or an abrupt change in tree line height can signal an upcoming low-head dam. Staying a safe distance downstream from the dam is advisable. Avoid anchoring your boat when situated in waters just beneath the dam. Dams can release large amounts of water within seconds. This increased water flow can swamp your boat or push it into hazardous situations. Avoid approaching a dam too closely. You could be caught in the backwash. Backwash creates a circulating motion that can pull you into the dam and make it difficult to escape. Boating safety is no accident. Always wear a life jacket, make sure your boat is in proper working order, have communication equipment, and keep your boat insured. These upstream and downstream tips for boating are really amazing. 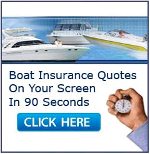 I am usually done boating in my free time. Definitely in future I will follow these tips.